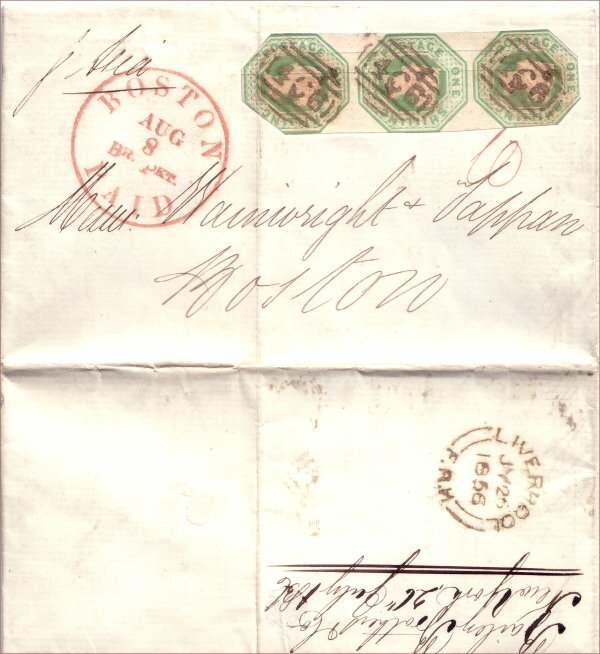 Paid double rate letter sent from Liverpool to Boston on board Cunard's 'Asia' in July 1856. The late fee of 1 shilling was paid along with the rate for up to 1 oz at the Floating Receiving House at the quayside. The FRH was open until 10 minutes before sailing of the Ocean liner. 'BOSTON / AUG 8 / BR. PKT. / PAID' applied on arrival in Boston. 'Asia' arrived New York on 7th August. The Boston mail was carried in a closed bag. The Treaty fee of 1/- for the first half ounce was introduced 15th February 1849 and applied until end December 1867. The FRH handstamp, Robinson type FRH1, was in use from 1849 to 1864. The FRH late fee of 1/- was reduced to 6d in September 1859. The Boston mark, B&D 707, has been seen used between 1854 and 1856. North Atlantic Mail Sailings 1840-75, W Hubbard and R F Winter.